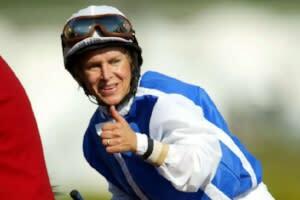 Saratoga Springs, N.Y. — Legendary jockey Julie Krone, the first woman inducted into the National Museum of Racing’s Hall of Fame, will sign autographs at the Museum on Sunday, Aug. 19 from 12:30 p.m. to 1:15 p.m. Autographs are $15 each with proceeds benefitting the Museum. Krone will be signing limited-edition prints of her groundbreaking victory aboard Colonial Affair from the 1993 Belmont Stakes. The prints will be sourced from original artwork by renowned artist Celeste Susany. The print is included with the autograph price. Prior to the signing, Krone will participate in the Museum’s Women in Racing Symposium from 10 a.m. to 12 p.m. The panel discussion will feature some of the most accomplished women in thoroughbred racing discussing their careers, how they got involved in the sport and what factors contributed to their success. Hall of Fame trainer Janet Elliot, all-time leading woman trainer Linda Rice, champion steeplechase jockey Blythe Miller Davies, top owner/breeder Charlotte Weber, Tampa Bay Downs owner Stella Thayer and racing analyst Gabby Gaudet are scheduled to join Krone on the panel. Longtime television broadcaster Charlsie Cantey will moderate the event, which is free to attend. Krone, who began her riding career in 1981, won 3,704 races and had purse earnings of $90.1 million. She became the first — and remains the only — woman to win a Triple Crown race when she piloted Colonial Affair to victory in the 1993 Belmont Stakes. Krone, who was inducted into the Hall of Fame in 2000, also became the first woman to ride a Breeders’ Cup winner in 2003 when she teamed with Halfbridled to win the Juvenile Fillies. She retired in 2004 with 132 graded stakes wins to her credit. For more information about the Museum, including special events and program offerings, please call (518) 584-0400 or visit our website at www.racingmuseum.org.